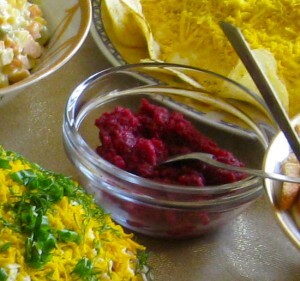 In Ukraine, this spicy sweet condiment or salad called khrin (хрін) is a traditional Easter dish, but it is known and used throughout the world under a variety of names and for a variety of purposes. In the US, it is commonly referred to as Red <Beet> Horseradish and its bright pink color makes it an interesting addition to more typical condiments. Peel and grate raw beets. Let them sit for a little while and then squeeze the juice out. Grate the horseradish and put into a bowl (note: the grating of the horseradish releases an enzyme that creates its spiciness. As the grated horseradish sits, it will become spicier – to a point – however if left too long, it will lose that pungent flavor and become bitter). Khrin is a delicious accompaniment to any sort of cooked or cured meat. On that spicy note – Happy adventures in Ukrainian cooking-with-beets! 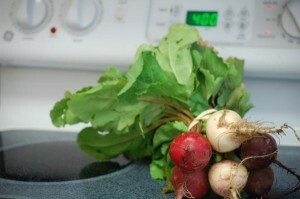 Leave a comment if you have other favorite beet-related or Ukrainian recipes. 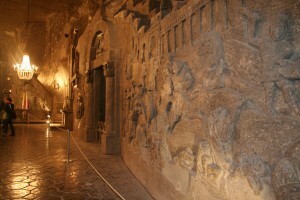 Central and Eastern Europe – khreyn or keen. Afterward, Agnieska would say it was God’s miracle. “It was the most beautiful place I had ever seen,” she’d tell her friend, Marta, and in saying so, she’d straighten her head kerchief—she meant it. Then, she would walk the two and a half blocks to church and thank Jesus for creating such beauty and splendor, for allowing her to see this miracle of clean glass, and polished marble, and doors that somehow slid open without any sign of knobs or hinges. But before she walked into the Galleria Krakowska and blinked in the fluorescent sunshine, Agnieska was afraid. On the rocking train, she fiddled with her green beaded rosary and consulted her crinkled, damp timetable every few moments. It was not as if she had never been on a train—this was, after all, her third ride—but she had never before traveled alone and never for so long and so far. Four stops later, after the train had pulled up to the platform in Krakow Glowny, the white-haired porter—a spitting image of her cousin, Edward, who had moved to Belgium just after the war—handed down her patched navy blue suitcase. Then he bid her farewell, touching two fingers to the brim of his hat, and she turned to the matter at hand. 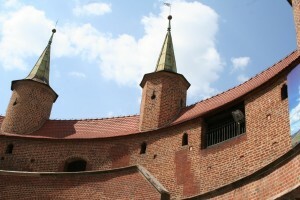 The blue-and-white signs tugged her along in the direction of Rynek Glowny, and out into a large, cement-paved square. Agnieska looked at the smudged face of her wristwatch—a quarter to eleven. At half past, she was to meet Pan Gorecki, a lawyer with Gorecki & Makowski, Ltd.
“It has come to our firm’s attention that you may have claim to several plots of land some 23 km outside of Tarnow. In accordance with current re-privatization laws, if you can produce evidence of your parents having lived and owned such land, you will be its legal owner. “If at all possible, we request most cordially that you come to our Krakow branch to discuss this matter. We represent a land development company, R&R Builders. They have expressed interest in your property, and we would like to make you an offer to purchase it. “Please feel free to contact me if you should have any questions at (012) 457 328 or by e-mail at gorecki@goreckiltd.pl. Agnieska finished the letter and folded it twice before placing it once again in her front right pocket. She looked around her, half expecting Pan Gorecki to come up to her, forty-five minutes early, and present her with a large check and keys to a glittering new automobile—it felt as if she had won the lottery, in receiving such a letter. Instead, what caught her attention was the large, glittering structure to the left of the train station. “Krakowia Galleria” proud letters proclaimed across its front. Glancing at her watch once again, she decided she had time to buy a few souvenirs before meeting up with the lawyer. So, Agnieska stood up from the cold marble bench and walked toward the mall. The first thing that struck her was the music: a young woman, screaming harshly, her f’s and t’s gyrating in a language that certainly was not Polish. Was that English? “No matter,” Agnieska decided, as she neared the mall. The doors slid open in front of her without a touch and Agnieska stopped short. 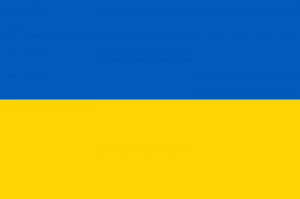 “Boże!” she exclaimed as a young couple stepped past her, eyeing her faded head kerchief and patched suitcase. She stepped forward cautiously. The door did not move. Pausing every few steps, Agnieska inched her way into the mall. And as she looked around, everywhere was light! Color! Glass! So much glass! The floors were scrubbed a perfect white, so clean that Agnieska could see a glint of herself when she peered down. There were stairs, many many stairs, but somehow, they were, why, they were moving! Just as the door had. Agnieska paused, and, without hesitating, crossed herself twice. She then began to explore. The lady, after all, was no stranger to a market place, and she quickly decided that, save the miraculous moving stairs and the glinting lights overhead, this mall was no different than the Saturday antique market back home. She quickly determined that she would need to purchase something for her friend, Marta. She smiled slightly at the humbled look that was sure to cross her friend’s face and tucked a stray lock of gray hair under her kerchief. So, with that thought of such disbelief, gratitude, and, yes, even a little jealousy, all sketched in Marta’s wrinkled features pushing her along, Agnieska set off for something fit for her friend’s kitchen. She still paused every few moments to take in the three headless mannequins modeling blue jeans to her right and the plush square sofas at the coffee shop on her left. She came upon “_______,” which, with yellow banners splashing along its windows, screamed of its huge clearance sale. Agnieska was intrigued. She shuffled in, and began poking at the various bowls and stirring spoons she encountered. Finally, there it was: the perfect gift—a multi-purpose, two-toned, eight-speed food processor. Although Agnieska had seen such gadgets flickering in advertisements across her television set on the evenings as she scrubbed her kitchen stove, she had never before held one in her hands. The TV itself had been enough of an achievement. Eight or nine years earlier, her nephew had brought it down from Warsaw. He had placed it carefully on its fake wooden stand, plugging it in, after a spark or two, to the side of the wall. But here was something different. Agnieska stood, her feet unmoving, her hands getting slightly clammy with excitement, reading the features on the back of the box. “Self-cleaning,” “stainless steel,” and “four interchangeable blades” threw themselves off the cardboard in sleek Polish phrases and bold type, and were all greedily consumed by Agnieska’s eyes. Her breath began to quicken. It was wonderful. She carefully pulled a white-and-red specimen off the shelf and walked up to the register, eying her watch as she did so: A quarter after eleven. “Hullo,” said the cashier, a sallow faced youngster with rather bad skin and hair sticking up at peculiar angles. “Good day,” replied Agnieska. She hesitated a moment at the moving conveyor belt in front of her, before she set down the box, the most impressive food processor clinking slightly within. She winced slightly at the price. Her bank account would not forgive that many zloty easily, but she rationalized that for a gift that would cause Marta to turn a particularly satisfying shade of pink—How could she, Marta, ever dream of topping such a present for Agnieska’s name day, after all?—was worth it. Besides, after meeting with Pan Gorecki, she was bound to forget the whole matter of money entirely. She slid the wrinkled bills across to the young man, he popped the box into a crinkling green plastic bag, and the whole matter was done. She headed for the door. Agnieska felt her heart pull at her neatly buttoned shirt. Her eyes squeezed shut and her hands shot to her ears. In doing so, her suitcase sailed out of her right hand, and the green plastic bag out of her left. Suddenly, Agnieska was back in her parent’s old farmhouse, destroyed more than half a century earlier. The chickens in the yard hadn’t been cooped up, and the dog was barking something terrible. She and her parents were tucked under their wooden oak table, holding onto each other, as they heard the most atrocious of sounds: gunshots firing over and over; shrieks and wails from so many voices; and always, always, that pervasive siren. Tanks were crashing along the road some 400 meters from their home, pushing their way through decades-old forest. Agnieska sat on the rough hewn floor and shivered, squeezing her eyes shut, and clapping her hands to her ears. It made no difference; she could still hear the sirens through her fingers. Her father had been shot that night. Three German soldiers, stopping for a drink of water, had thought he looked too Slavic. Still in the mall, Agnieska did not stop to retrieve suitcase or blender. She knew only that she had to escape that noise. She began to sprint, her two old legs knocking at the knees, out of the store, and then, barely pausing for the doors to slide open, out of the mall. There, the train station was there, on her left, still standing, resolute. Although her breath was coming out in three-tone wheezes, Agnieska hardly lessened her pace. That siren, she could still hear it, somehow, back there, in the mall. She hastily consulted the departure schedule. Seeing that a train left from platform four for Wroclaw, in a mere two minutes, she galloped, her hips and knees screaming, up the stairs to the platform and onto the train. Afterward, Agnieska would write a letter to Pan Gorecki. She would explain that she had not been able to make the trip, that it was too long, and that he should send along the documents, for her and her nephew to consult at home. But to Marta, she would speak only of the mall. She would say: “Traveling all that way? Why, to see such a miracle, I would gladly go again,” before leaning back into the creaky oak chair and taking a sip of lemon tea. Marta, for her part, would shake her head—“How is this possible?”—before crossing herself. And both women, tea in hand, would rock quietly away at the fireplace, blinking in the setting sun. 1. Walk around the Planty. 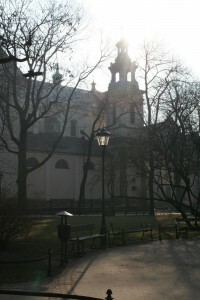 The Planty is the park that surrounds Krakow’s Old Town. It’s a great way to get a feel for the city. You can walk around part of it and then go through St. Florian’s Gate at Ullica Florinska up into the main market square, Rynek Glowny. Also be sure to climb up in the Barbikan, one of the last remaining bits of the medieval wall. Plus, snap a picture with the statue of Copernicus at the nearby Jagellonian University. If you’re looking for a quick break from your stroll, there’s a great English language bookstore only two blocks away called Massolit. Grab a cup of their great coffee and pick up one of their ornate bookmarks as a free souvenir. 2. Try beer with juice—trust me. In Polish, it’s “piwo z sokiem.” Memorize those three words. Be sure to get a Zywiec with cherry, or better yet, ginger. They’ll serve it to you with a straw. Stir up the juice at the bottom and you’re good to go. It might not feel like drinking a beer to purists, but it’s definitely worth a try. 3. Don’t be afraid to be assertive. From my experience, Poles are a no-nonsense bunch who can get frustrated with out-of-towners, especially given Krakow’s rising popularity as a tourist destination. With that in mind, don’t be afraid to assert yourself in ticket lines, at restaurant counters, and anywhere else….they’ll respect you for it and you’ll get more done. As with any foreign country, it’s useful to have your destination written down in Polish (ask for help at your hotel) so you can hand that to the person at the train station. Also, don’t forget practice saying “thank you” in Polish: It’s dzienkuje, or phonetically: jen-koo-yeh. 4. Take a ride on the Pope Train! Poland was home to Pope John Paul II, who is very revered as a national hero, especially given his advocacy for the Poles’ rights during the Cold War. If you fancy traveling the footsteps of the Polish pope, consider taking a ride on the bright gold papal train, which leaves from Krakow’s main train station daily. There are multiple stops on the train, including to Pope John Paul’s birthplace, the small city Wadowice. While there, try out a so-called Pope Cake, the pope’s favorite delicacy as a boy. They’re delicious, but enormous, so don’t be afraid to split one. 5. Set aside some time for day trips. In the surrounding area near Krakow, there are a number of fascinating spots to see, including Auschwitz-Berkinau, the largest concentration camp during the Holocaust, and, for something entirely different, the Wieliczka Salt Mine. Auschwitz truly cannot be missed, even if it’s obviously a very sobering experience. The salt mine couldn’t be more opposite, and is pretty campy, but the underground chapel with its ornate salt chandeliers is a spectacular site, and the tour gives interesting insight into one of the region’s major industries. Plus, the tour guides (English speakers are readily available) wear hard hats. You can’t really ask for more than that. I’m aware this is my second alcohol tip, but you don’t want to miss out on this one. Go to any bar in the city and order a Tatanka—yes, like the word for “buffalo.” It’s made with Zubrowka vodka, a Polish specialty, and apple juice (check out their website, they even show you how to make this drink!). The combination tastes exactly like a cinnamony slice of apple pie. If you’re lucky, they’ll even put an apple slice in your drink. Classy, no? Note: This drink is called different things in different parts of Poland, so if you’re in Warsaw, it might be called a szarlotka (apple cake). Ask the bartender. 7. Consider visiting over a major holiday. 88% of Poland’s population is Catholic. Because of this, each major Catholic holiday, the city puts on a festival in its main square, complete with local merchants hawking handmade wares and delicious food, and plenty of entertainment. The drawback with this is that, of course, fewer businesses will be open (definitely check operating hours before you go to any major attractions), and major religious sites, especially nearby Czestochowa, a famous Catholic pilgrimage site, will be crowded. 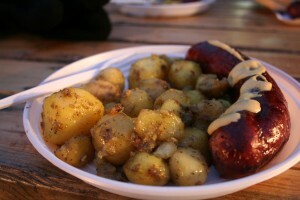 Still, if you want an authentic Polish experience, consider booking your trip in the spring, especially near Easter. Make sure to check out a holiday mass in St. Mary’s Cathedral, the spectacular church in the main market square. 8. Eat. All. The. Time. Especially worth trying are the street vendors’ pretzels for a great breakfast snack, and the zapikeinki, a long piece of bread covered in pickles and various sauces. In the main market square, look for the guy dressed as a giant beer mug. He’ll give you a coupon for a free beer at a restaurant right near the Wawel Castle. It’s a bit more touristy than some places, but the English menu serves as a great introduction to some of the best Polish foods: perogi—delicious cheese-, meat- or even fruit-filled dumplings (try the Ruskie-style, filled with cheese and potato)—and keilbasa, a type of sausage. 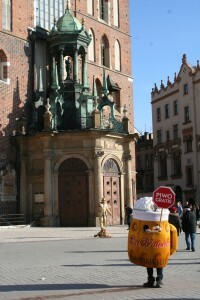 Warning: If you want to take a picture with our friend the beer mug, beware that you’ll have to pay a few zloty to do so. 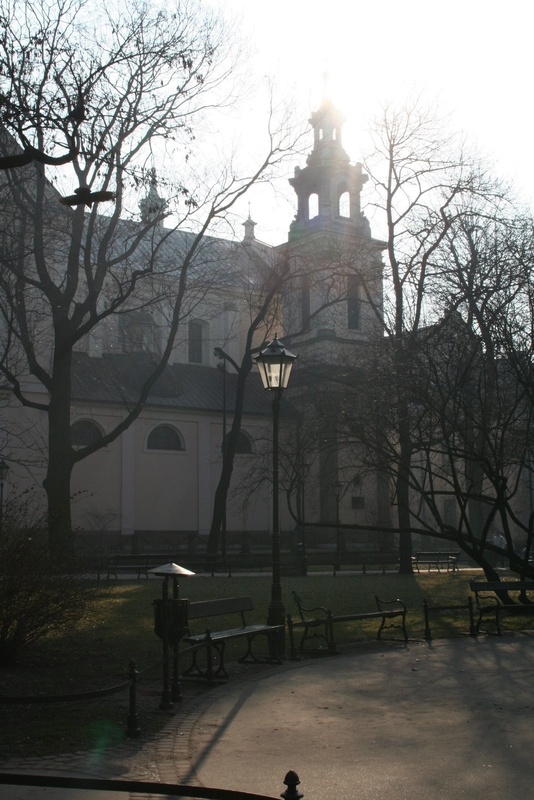 When I first arrived in Krakow, Poland, for my semester abroad in February 2008, I was just getting back into running after a three-year hiatus. I’d spent that January staying with a friend in her London flat and traveling some around Britain and Europe before my program in Poland started. As my bank account had dwindled over the month, I forced myself to put aside my passport and suitcase for the last week I was in London and decided to try to find cheaper ways to entertain myself (Hey! That’s the name of the site!). Running along the Thames was cheap (free!) and I got to see more of London than if I were walking, so I decided to lace up my shoes again. At that point, running for me, after having taken so much time off, was a ridiculous effort: I’d lope along at a 10-minute mile pace for five to seven minutes, before giving myself a few minutes’ walking break to try to get my heart rate down below 150 again. “I’ll ease into it,” I told myself, as I’d drag my body back into my friend’s flat, my cheeks siren red from my efforts. 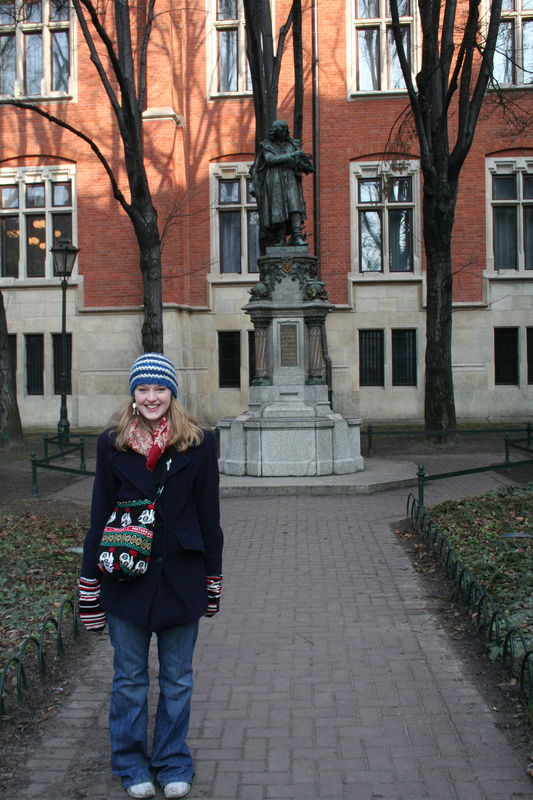 And so I was still, a week later, during my program’s orientation to Krakow. A brief history lesson: Krakow is one of the few Polish cities that wasn’t badly damaged during World War II. While Hitler’s army annihilated 98% of Warsaw’s buildings, the Fuhrer decided Krakow, as a city, was not of Slavic origin, and could therefore be spared. His reasoning was that the city had been under the Austrian Empire after the Partitions of Poland in 1795 (until 1918, when Poland was briefly put back on the map as a republic, before being taken over by the Germans during WWII). Even though the city has roots leading back to 966 C.E., it was really a Germanic city, through and through, Hitler decided. 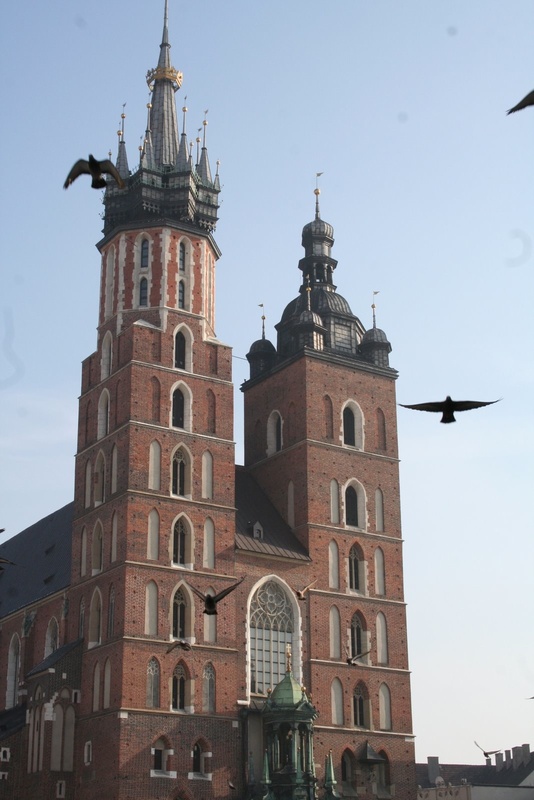 Satisfied with this version of history, Hitler quickly named Krakow the capital of his Nazi Polish government. He went on to install his new Nazi governor in Wawel Castle, a gorgeous fortress atop a hill in the center of Krakow that’s believed to be the birthplace of Poland, and a huge point of pride for Poles. What all this history meant, for this 21st century American foreign student, was that Krakow’s Old Town, despite—and also because of—the city’s troubled history, still retains its feel from centuries ago. Each cobble-stoned street is lined with pastel-colored Baroque buildings. They all lead up to the Rynek Glowny, the largest market square in Europe, where the 15th century sunshine yellow Cloth Hall sits at its center and is home to a flower and handicrafts market that operates year-round. My study abroad program’s guide, Anna (pronounced AHN-ya) spent the morning of my first full day in Krakow showing us around Rynek Glowny and Krakow’s Old Town. She pointed out St. Mary’s Cathedral, with its mismatched towers (so designed, or so the story goes, by two rival brother architects, one of whom killed himself in shame when his tower was shorter and less beautiful than his brother’s), and directed our attention to the Clock Tower, the only remnant of Krakow’s 14th century Town Hall. Then, she ushered us out of the square. A few blocks’ walk and we’d reached the Barbican, a circular brick fortress with an imposing portcullis. She shifted on her feet. “They replaced it with what we call ‘The Planty.’” She motioned around her, to what I’d thought was a small, narrow park. “How long is the whole thing?” I asked Anna, very aware of the fact that I’d had to stop and walk barely 3/4s of a mile into my run the previous evening. “Oh, it’s very big,” said Anna, avoiding answering the question, a habit I’d soon learn is common practice among her countrymen. “Do you have a guess?” I persisted. So now I had a goal for myself: I’d run from my dorm a mile or so out of the city center, run the whole Planty and then run—…or maybe walk, to, erm, cool down—back. With that goal in mind, I spent the next handful of weeks working toward it, running around a huge park near my dormitory. I dodged Rottweilers and Dobermans (the Poles seemed obsessed with muscle dogs). I trotted past bronze statues of Pope John Paul II and Marie Curie, both cherished nationals. I wove through bummed soccer fans after a tough loss at a nearby arena. And on nearly every run I got heckled by the usual suspects—teenagers and construction workers—and gawked at by just about everybody. It turns out no sane person runs in Poland, least of all the way I was doing it: red-faced and puffing ten minutes in. Spring arrived. I’d worked my way up in mileage and decided one sunny Saturday morning that today was my day to tackle the Planty. I stretched out in my dorm room and bid my roommate farewell (She, too, thought I was a bit nuts, but later admitted that she respected me for my fearlessness to wear skintight, not-hiding-anything running tights, especially in the most Catholic—and therefore fairly conservative—country in the world). I made it to the Planty without issue and turned onto the trail. With the warmer weather, the trees lining the path had leafed out. The whole trail was green and blooming. It was lovely. And crowded. Krakowians were out en masse enjoying the weather, and I found myself dodging more than the occasional Doberman in order to make my way. I glanced at my stopwatch. Wait a second. I was making really, really good time. I’d been running on the path for maybe twelve minutes and was, as far as I could tell, already one-third of the way around the city center. 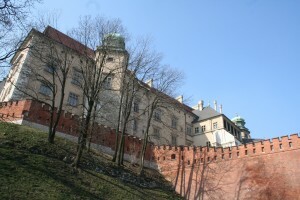 But before I could ponder it more, I rounded another curve, this time right near the base of the Wawel Castle, and nearly took out a five-year old girl with her father. Coming up short, I realized I’d run right into what looked to be a spring carnival, being held along the banks of the Vistula River. I was forced to slow to a walk for a moment, trying to get my bearings. There were children and their parents everywhere, all up and down the sidewalk. Popcorn and cotton candy vendors were out hocking their wares. Teenagers were lobbing softballs at milk bottles to win their sweethearts giant stuffed animals. The popcorn smelled delicious. And—oh! Were those mini-donuts? I had to get outta there, and quickly, before my resolve to run the Planty faded away. But I was stuck. The street fair looked like it went on for a ways. I couldn’t turn off on a side street without giving up on my goal. Plus, there weren’t any around anyway. I was pinned between the riverbanks to my left and the hill with the Wawel Castle atop it rising up beside me on my right. I didn’t have a choice: In order to make it around the Planty, I was going to have to run through the whole carnival, Spandex pants and all. There might have been some pointing. Perhaps some laughter. I know for certain there were mouths that fell open, many gaping at my pants, my face—which was flushed its usual deep red, as it always is when I run—and most of all, my stride. “What is that girl doing?” they asked each other in Polish. Eventually, after I nearly ran into a cotton candy salesman and had to duck around three or four enormous dragon stuffed animals, I made it to the other side. There, I realized I was now halfway around the city center—so two and a half miles around, in theory—and it had only taken me fifteen minutes. I was getting in better shape, sure, but I wasn’t that good. I started to think that maybe Anna was a bit misinformed. And that maybe when I’d told one of my Polish teachers about my goal and her eyes had gotten huge, that maybe she, too, had bought into the whole “The Planty is very big” mantra. And then I really started to think that maybe I would need to do my long run the next day. Ten minutes later, and I’d made it. I’d run around the entire Planty, the whole thing, all “five miles” of it, in less than thirty minutes. And I have to say: Those five miles were the quickest, most popcorn- and cotton candy-filled miles I have ever run. Goal accomplished.